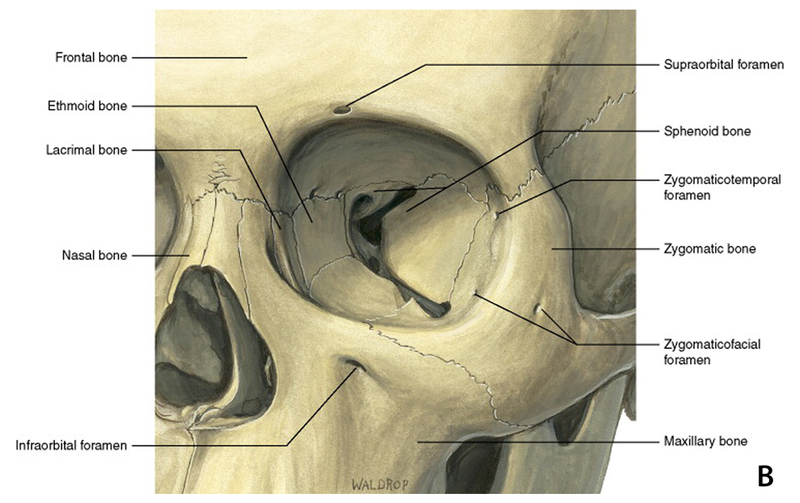 Identify orbital and eyelid anatomy associated with orbital compartment syndrome and lateral canthotomy/cantholysis. 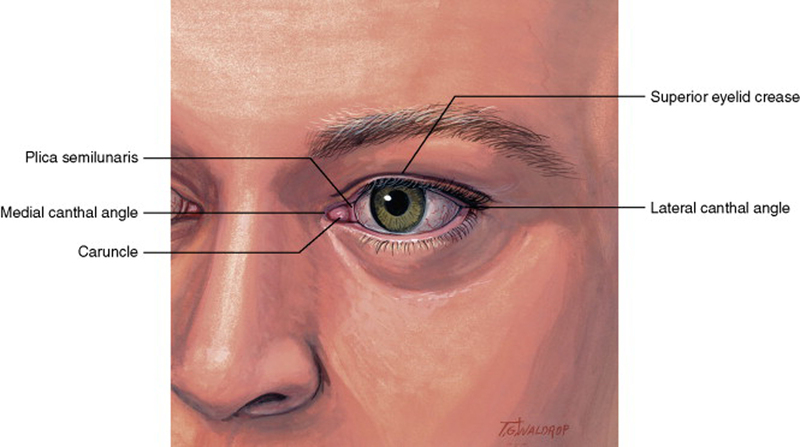 Describe the signs of orbital compartment syndrome and evaluation for lateral canthotomy/cantholysis. Orbital compartment syndrome refers to a situation in which an expansile process within the closed compartment of the orbit leads to increased orbital pressure, which can further lead to ischemia and vision loss. The diagnosis of orbital compartment syndrome is made based on clinical findings and should be suspected in patients presenting with the following constellation of symptoms: acute proptosis, elevated intraocular pressure (35-40 mmHg), rapid vision loss, ophthalmoplegia, and fixed dilated pupils or a relative afferent pupillary defect (RAPD). Orbital compartment syndrome requires immediate treatment to prevent permanent vision loss. Time to intervention should be within 90-120 min from injury to prevent vision loss (based on primate studies) . 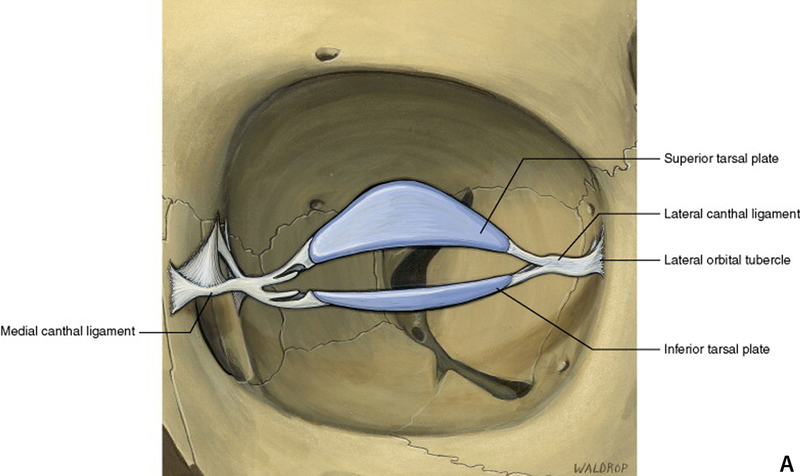 The orbit follows pressure-volume dynamics similar to other compartment syndromes: Increased tissue pressure in an enclosed space leads to decreased perfusion. When the intraorbital pressure exceeds arterial pressure supplying the optic nerve and retina, ischemia results. Stretching of the optic nerve and vessels can also result in vision loss. If a Desmarres retractor is not readily available, a paper clip may be used to aid in elevating the lids off of the eye . Assess the status of the affected eye. Generally, lateral cantholomy/cantholysis are contraindicated when the eye is lacerated or ruptured. If the eye is intact, proceed with lateral canthotomy/cantholysis. If inferior cantholysis is insufficient, consider release of the superior crus in a similar manner as the inferior crus was released. Care should be taken to avoid the lacrimal gland and its ductules. 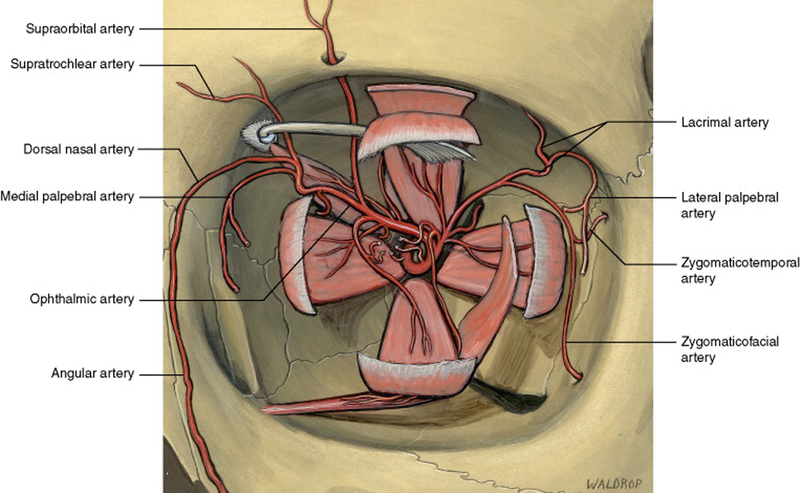 Dutton, Jonathon, Atlas of Clinical and Surgical Orbital Anatomy; The Eyelids and Anterior Orbit. Elseveier (2nd edition), 2011. Chapter 8, pp 129-164, figures 8-1, 8-5, 8-8, 8-16; Chapter 2, pp 15-27, figure 2-1; Chapter 5, pp 83-98, figure 5-1, 5-2. Hayreh SS, Kolder HE, Weingeist TA. Central retinal artery occlusion and retinal tolerance time. Ophthalmology. 1980;87:75–8. Dinn, Robert. "General Ophthalmology Tray". EyeRounds: The University of Iowa, Ophthalmology, 12 Mar. 2007, http://EyeRounds.org/tutorials/instruments/General/index.htm. Tse DT. A Simple Maneuver to Reposit a Subluxed Globe. Arch Ophthalmol. 2000;118(3):410–411.